I was reading Agrippa and noticed that he says of Mercury talismans that they, "render the bearer thereof gratefull, and fortunate to do what he pleaseth: it bringeth gain, and prevents poverty, conduceth to memory, understanding, and divination, and to the understanding of occult things by dreams:"
Three Books of Occult Philosophy, Bk II, ch 22. Bring gain and prevent poverty, eh? That's sounds pretty good just about now! 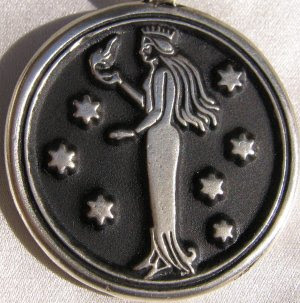 So I am pleased to present a new Mercury talisman. These are smaller than the standard Mercury talismans but packed with the same savvy, cunning, clever Mercurial energy, just what you need to negotiate the current financial path, strewn as it is with avalanches and rockslides. These talismans are 1/2 the price of the standard Mercury talismans, just $99 plus shipping. Shipping is $12.95 for insured US shipping, $29 for insured non-US and while I don't recommend it, you can ship non-insured non-US for $14.95, however this means you bear the risk of loss! If you are into astrological magic at all, you really owe to yourself to us it and get as much help as you can financially for now and for the foreseeable future. Wade and I specialize in wealth, prosperity and financial talismans! We both have very strong Jupiters and it shows in the results we get personally and for our clients with money talismans. 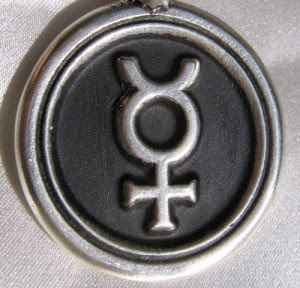 The new Mercury talismans are a great and affordable way to tap into the power of astrological magic and Mercury himself, who is particularly suited to sales, marketing, stocks, investment, Internet and high tech ventures, as well as writing, communications, occult knowledge, magic and astrology. Traditional astrology is sometimes accused of tarring Saturn & Mars as utterly evil planets, while modern sometimes goes to the opposite extreme and reduces Saturn & Mars to "challenges" that with a positive attitude and proper affirmation, can invariably be overcome. Part of this difference in attitude towards Saturn & Mars comes from the different purposes to which modern and traditional astrology are put. Modern astrology is predominately natal and psychological in approach. It seeks to understand the patterns of the psyche in the chart and offers a therapeutic approach to dealing with psychological problems. Traditional astrology is oriented towards outward concrete events and making precise, accurate prediction regarding these events. It therefore makes sense for modern astrology to be very optimistic. After all, a therapist is not going to say to a patient, "1/3 of people don't improve with treatment." They want to give every patient the opportunity to benefit from therapy and encourage them as much as possible to be optimistic about their prospects. Traditional astrology, on the other hand, is seeking to predict events. It therefore needs to be able to quantify indications in the chart, be it horary, natal, electional or mundane, that range all the way from very good to very bad, with all of the shades of gray in between. The essential dignity system (here is more information on the Essential Dignities ) is one way this is done, for as the planets move through the Zodiac their dignity and strength or debility and affliction can be precisely calibrated. Another very important indicator of often negative events are the malefics, Saturn, the Greater Malefic and Mars, the Lesser Malefic. These are balanced in the traditional system by Jupiter, the Greater Benefic and Venus, the Lesser Benefic. Indeed, the Renaissance sage Marsilio Ficino advises that, "When you fear Saturn, use Jupiter" Three Books on Life, Bk III, ch 7, Kaske & Clarke trans at 275. Saturn rules all sorts of nasty things, for example, Agrippa says that of places Saturn rules, "all stinking places, dark, underground, religious and mournful places, as churchyards, tombs, and houses not inhabited by men, and old, tottering, obscure, dreadful houses, and solitary dens, caves and pits, also fishponds, standing pools, fens" Three Books of Occult Philosophy Bk I, ch. 47. As much as we might not like stinking dark places, they do exist in reality and thus as everything is ruled by one or planets, even unpleasant things need a ruler and signifier. "No sign or planet does evil with respect to its proper quality. This is because it has goodness and because good and evil are contraries. But through accident, according to the dispositions below, the same planet can do good or evil by its proper quality. " "As with the Sun, which by its brightness and heat does good to the hunter, who shoots the stag with an arrow, for without brightness, the arrow could not reach the stag. 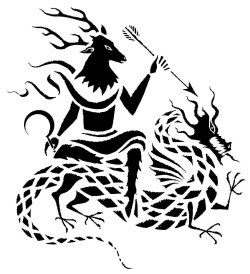 But by the same brightness and day, the Sun does evil to the stag, killed because of the Sun, which gives day and brightness to the archer with which he can see the stag." Ramon Lull, Treatise on Astronomy, (Hindsight, 1994) Bk I, Page 40. What Lull is alluding to when he mentions the "dispositions below" is the Neoplatonic/Hermetic view that the higher celestial and spiritual realities manifest imperfectly in material things. This is our opportunity with Saturn and Mars, first to respect their necessary role and second to cleanse ourselves of the imperfections imposed by matter and work with the essence of the planets themselves. The energy of Saturn and Mars can be difficult to take, less pleasant and enjoyable than Venus and Jupiter, but ultimately it may be Venus, who leads astray through pleasure and Jupiter, who leads astray through wealth, who are the true malefics! I have been asked how I can do magic, when it is possible that the magic may interfere with someone else's free will. This often comes up in the area of love magic. First, I would begin by saying that Renaissance astrologers did not subscribe to the Stoic idea that all things were absolutely fated. They were generally Christians and fairly orthodox and accepted that Free Will existed. However, they saw the body and passions as under the rule of the stars and only the divine part of humans (soul or spirit) as capable of exercising free will. Thus both Fate and Free Will operate simultaneously. My experience, both astrological and personal, tends to support this. I frankly don't see many people, myself included, exercising free will. Think about it. Free Will is not choosing Coke over Pepsi or a BMW over a Porsche. This is merely choosing to a method to satisfy our passions and desires. One of our modern archetypes, a strongly held belief, is that we are rational, logical individuals, that we can make our own fates. If this were so, then we could not predict even a person's character or psychology from their chart, let alone make the sort of precise prediction that traditional natal and horary are capable of. So, as a preliminary matter, I question whether people have that much free will in the first place that can be interfered with. Essentially we must go with the flow as astrological magicians. We can make use of the natal chart of the person we wish to affect, but that just tells us what they are fated to do and what sort of lures they are susceptible to. Now I do not do any form of malefic magic. I will not assist in magic or elections to cause any sort of harm or damage. I will not even do breakup spells. However, if I refused to do any magic that influenced others I could not do any magic at all! Secondly, I have noted that moderns are extremely squeamish about the idea of using traditional supernatural or spiritual powers to influence others. They are not at all concerned about other methods of influence. I have never been condemned for advertising, marketing or public relations, but these are, in fact, extremely powerful techniques of mass magical mind/consciousness control. Let's look at mind control and influence on a more personal level. Do we condemn a woman wants to seduce a man and asks his friend about his likes and dislikes, changes her style and clothing to suit him, wears makeup and perfume, makes frequent eye contact, laughs at his jokes, puts her hand on his arm, all with the intent to influence and inflame him? Much of this seduction is taking place on an unconscious level for him, he is only aware that he is enthralled by her. So while this has been a rather long answer to the question, the bottom line is that there can be no doubt that magic is an attempt to influence and control the will of others. If the potential user does not wish to do this, one should not practice magic. But to be consistent one should not advertise, market or use public relations. One should show up for dates, interviews and public occasions unshaven and unshowered, when asked "am I too fat?" one should honestly answer "Yes!" etc., etc. Indeed, isn't counseling an attempt to influence and change the will of the patient? Certainly the therapist may have the best intentions, but aren't they trying to change the patient, to influence them to be what the therapist believes to be a better way to think, feel and live? I was recently reading a complete translation of Alf laylah wa laylah or The Thousand and One Nights, also known as the Arabian Nights. There are many variants, but this is basically a medieval Arabic text. I came across this interesting discussion of talismans. In this story, "the Wisdom beneath the Severed Heads" a young man is being tested on his knowledge. "You have escaped death a second time, young man" said the princess, "Now tell me to what [do] talismans own their virtue?" The young man answered from his horse: "O, princess, they owe their sublime virtues and miraculous effects to the letters which compose them; for there is no letter in the language which is not governed by a spirit, ray or emanation of the virtue of Allah. The spirits of the intellect communicate with those of the soul and the those of the soul with those of the senses. Letters form words and words form sentences; and the sentences written on talismans are nothing but a collection of spirits which, though they may astonish the ordinary man, do not trouble the wise; for the wise know the power of words and are aware that words govern the whole world. Whether they are written or spoken, words can destroy kings and ruin empires. " Mathers translation, Vol IV, page 85. 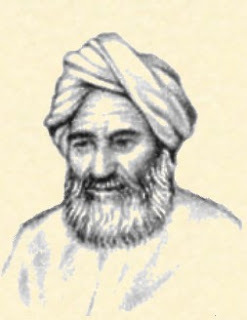 More on Al-Biruni & Islamic Astrology. If you are thinking like a traditional astrologer, if you have a traditional world view, then you are going accept and agree with 99% of traditional technique. You are not going to want to change it just for change's sake because that isn't a traditional approach. You are going to respect tradition and stick with it! The initial problem we have as traditional astrologers is just getting moderns weaned off of modern technique. On Spiritus Mundi, my personal discussion group one method we use to ensure that we stay on track is to require only that traditional technique be used. How do we define traditional technique? We can find it in a source published between 1200-1700 in Europe and actually used between 1200-1700 in Europe. 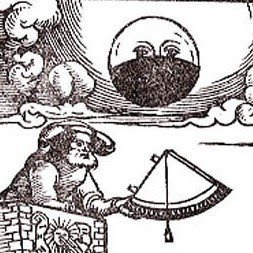 the effect of freezing all traditional astrology permanently as written in 1647. Definitely the student of traditional and the learner needs to stick strictly to what our sources say. But at some point those who have mastered traditional astrology need to be able to develop their own individualized technique. (1) This individualized technique is just for those with mastery. Perhaps we can provisionally place mastery as having judged over 1,000 actual horary questions by posed by others using just traditional methods. This limits it to a pretty small group! (2) The individualized technique cannot violate the key tenets, the framework of the traditional astrological system. Ascendant or 7th house, this is a secondary indicator of divorce. Of course I would not judge divorce solely on that indication! Now the use of the outer planets in this fashion is very limited. I use a very small orb and only conjunctions and only consider them if they are germane to the question and conjunct a significator. They do seem, however, to be sensitive points, analogous to a fixed star and useful secondary indications. of the traditional planetary rulerships. Also it interrupts the planetary hour and the sequence of the days of the week. Are we going to have Uranusday now? Finally, philosophically the basis for using the outer planets seems to be that "well they physically exist so you must use them" In other words, the physical planets are paramount. Whereas the traditional, at least Neoplatonic/Hermetic view would be that the physical planets are an imperfect reflection of deeper, underlying spiritual order. The traditional planetary rulership system is more perfect, more symmetrical and thus more reflective of the underlying spiritual order which is paramount over the material in stark contrast to the modern view. What I am trying to do is work through how the small group of masters of traditional astrology can stay within the tradition and yet not be stuck doing nothing that is not found in Lilly or other traditional sources. I have no personal desire to innovate, and indeed I have never come up with a single new technique myself. I don't however, want to freeze the practice of traditional astrology permanently. There are ways to add to the practice, to develop our own individualized technique while still remaining within the tradition. But remember kids, don't try this at home, wait until you have done 1,000 charts and you will find your desire to innovate almost non-existent. I received insight into a major difference between the modern and traditional approach at a lecture I attended by a fairly well known astrologer who uses some traditional techniques. The astrologer mentioned the question of reception. Now by Lilly's day reception meant mutual reception, that is where one planet is in the sign (and sometimes exaltation) of another, e.g. Sun in Scorpio, Mars in Leo (sign/sign) or Sun in Aries, Mars in Aries (sign, exaltation). 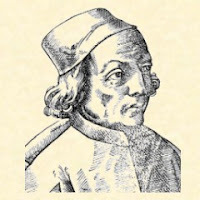 However, the astrologer neglected to mention that Bonatti in the 13th century and earlier medieval Arabic astrologers did not limit reception to mutual reception, though this was a particular strong form of it. For Bonatti to be in reception planets had to be making an applying aspect and one planet had to be in the dignity of the other. This was further restricted by the fact that the dignity was either sign or exaltation, or any two of triplicity, term and face. Also if either of the planets was in each other's detriment or fall, reception was ineffective. We can see that this definition includes mutual reception, but is broader. The astrologer then went on to mention Ivy Goldstein-Jacobson's "theory" that planets in mutual reception "change places" Now this is something she invented herself and traditional astrologers have spent the last 20 years trying to stamp out in traditional horary. The astrologer then "proved" that this technique works using celebrity charts and a horary. The horary question was, "Should we accept the offer for the house?" Now these are fairly straightforward questions in traditional horary. We use the 1st house and ruler for the querent, here the seller, the 7th house and ruler for the buyer (in this question) the 4th for the property and the 10th for the price. As first ruler was applying to an opposition of 7th ruler , clearly the answer was, "no, do take the offer", or alternatively "you won't take the offer" Same difference. Rather than this simple exposition, the astrologer launched into a complex and confusing digression about the proper method to evict the tenant then residing in the property and the outcome of that effort. This prediction was correct, but I couldn't follow the explanation or replicate the result myself. What I realized was that this astrologer was basically using a modern approach with a few traditional elements added. What this means is that the chart is basically equivalent to a crystal ball, tarot cards, or the entrails of animal. They are methods for accessing the psychic powers of the soothsayer. All quite effective divination techniques in the hands of the proper person, but not really a system that can be taught. Now I have been asked if I am a psychic. My usual response was, "no, astrology is a science" I realize that this is not quite true. I do use intuition, but only after casting a chart and letting the chart lay out the parameters of the answer. Once the chart gives me a number of possibilities, then I can use my intuition and judgment to decide on the correct one. For example, was the answer to the astrologer's question, "Don't take the offer" or "You won't end up taking the offer (perhaps it will be withdrawn or there will be problems with the buyer)? I think this points up a fundamental difference between traditional and modern astrology. Traditional lays out an answer systematically and then applies intuition to the possibilities set out in the chart. Modern jumps right to intuition, but thinks it is a science. The other insight is being a little bit of a modern astrology is like being a little bit pregnant. Even if you use some traditional techniques, if your approach is modern, you are a modern astrologer. 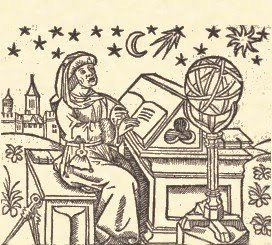 The Liber Fructus or Centiloquim attributed to Ptolemy says, "One skillful in this Science may evade many effects of the Stars, when he knows their Natures and diligently prepares himself to receive their effects." Aphorism 5. Thus it is not so much a question of getting whatever we want, but adjusting ourselves to the cycles of the Heavens, particularly by being psychologically prepared for their effects. 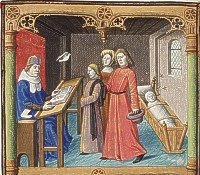 Another aphorism from the Liber Fructus, "In the election of day and hour, the two Infortunes are very useful and thou must use them as the Physician doth poison, skillfully for the cure of man." Aphorism 10. Thus we do not simply flee from Saturn and Mars, but we must understand them and make use of them when appropriate. Part 2 (Arhat ed.) page 55. The benefic and malefic qualities are mixed in each planet though the benefic tends to manifest more when the planet is dignified and the malefic when it is debilitated. So we must pay a price for knowledge of these occult and esoteric matters and that price is a certain amount of isolation and melancholy. As Ficino notes in the first book of his Three Books on Life, both Mercury and Saturn, which rule this sort of contemplative thought and study, are cold and dry, which is the nature of melancholy. "Suffumigacions plurimas facias, perfecte credas, ieiunabis sepe, multas fundas oracions, loca operibus digna elige, aspectus planetarum aspice. He autem operum magice sunt radice." "Plentiful suffumigations, complete confidence, frequent fasting, many prayers, picking a worthy place for the work, considering the aspects of the planets. These are the root of magical operations." More here on Picatrix and Astrological Magic. An excellent in depth answer to the question of what Ficino's theory of beauty was can be found in Speech V of his Commentary on Plato's Symposium on Love, translated by Sears Jayne (Spring Publications, 1985) beginning on page 83. 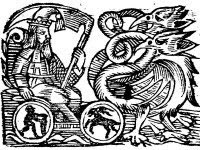 Briefly, however, Ficino says that the Face of God can be glimpsed in three mirrors, the three worlds of the Angels and Archetypes, the Anima Mundi or Soul of the World, and in the Material World. "The grace of that divine face" says Ficino, "we call beauty" and the desire and longing produced by that beauty is love. "But why do we think that Love is a magician? Because the whole power of magic consists in love. The work of magic is the attraction of one thing by another because of a certain affinity of nature. But the parts of this world, like the parts of a single animal, all deriving from a single author, are joined to each other by the communion of single nature...From this common relationship is born a common love; from love, a common attraction. And this is the true magic." Commentary on Plato's Symposium on Love, page 127. 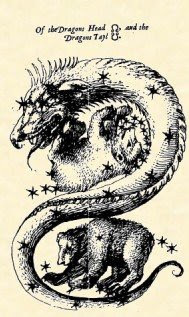 More on Marsilio Ficino and Astrological Magic. 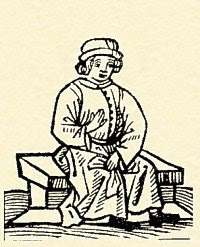 Here is part of the Physician's Portrait from the General Prologue of Geoffrey Chaucer's 14th century Canterbury Tales. 424: Anon he yaf the sike man his boote [cure]. The modes associated in the Renaissance with each planet are listed with the final or note upon which each mode cadences listed in parentheses. The characterization of the music of each planet by the Renaissance philosopher and astrologer Marsilio Ficino are also given. “voices that are slow, deep, harsh and plaintive” Marsilio Ficino, Three Books on Life, Bk. III, Chapter 21 (Kaske & Clarke) page 361. “The music...of Jupiter is deep, earnest, sweet and joyful with stability.” Three Books on Life, page 361. “...voices that are...quick, sharp, fierce and menacing...” Three Books on Life, page 361. “...if [the songs] with their grace and smoothness they are reverential, simple and earnest, the songs are judged to be Apollo’s [the Sun’s].” Three Books on Life, page 361. “To Venus...we ascribe songs voluptuous with wantonness and softness.” Three Books on Life, page 361. Ficino says that the voice of the Moon is in between that of Saturn and Mars. Three Books on Life, page 361. 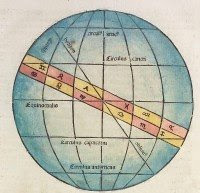 Traditional astrology, the astrology practiced before 1700, used the seven ancient planets, visible to the eye: Saturn, Jupiter, Mars, the Sun, Venus, Mercury and the Moon. 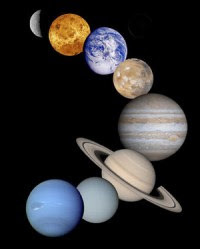 The word planet comes from the Greek, planetos, wanderer, and comes from the fact that the planets moved in their own distinct orbits against the backdrop of the fixed stars and constellations. Each planet was associated with a Greek or Roman god and the qualities of a planet had a great deal to do with the god it corresponded to. While this is taken for granted by many astrologers it does appear somewhat puzzling. Why would a ball of rock or gas, seemingly randomly placed, have anything to do with pagan gods? The answer is the key to traditional astrology and the philosophies that explain it. Traditional astrologers lived in a world of Divine order created by God with a web of sympathies and correspondences that connected everything in the Cosmos. 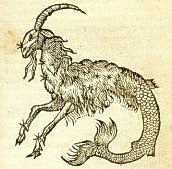 The Renaissance philosopher and astrologer Marsilio Ficino says, "Most important, the cosmos is itself an animal more unified than any other animal, the most perfect animal..." Marsilio Ficino, Three Books on Life, trans. Kaske & Clarke (MRTS, 1998) p. 251. As the Great Man the Cosmos as Macrocosm corresponded to the individual man, the Microcosm. Each person is a Universe complete unto themselves perfectly ordered and connected to the whole of Reality. 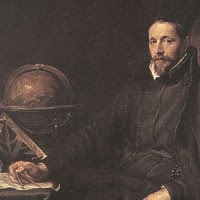 For Renaissance philosophers and astrologers the planets were a key part of the Celestial World, itself the essential link between the Divine World of Angels and Intelligences and the Material World. Each of the planets rules a myriad of things here in the Material World. 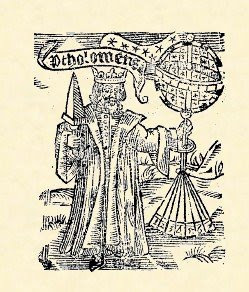 The famous English astrologer William Lilly states, for example, that Saturn rules old men, brick makers, the spleen, hemp, crows and lead. Christian Astrology, pages 57-60. What this means is that each of the things ruled by a particular planet share certain qualities, powers and virtues embodied in a celestial form exemplified by their planetary ruler. The planet, in turn, is the instantiation of one or more Divine Forms or Ideas. Thus everything in the Material World has its origin in the Divine World through the mediation of the celestials. It is the characteristic of matter that it resists the imposition of Forms and Ideas. This quality of matter means that all material things will lose their forms through decay and death. In addition, the Heavens are constantly pursuing their ordered orbits, endlessly imposing change on material things. Thus birth, corruption, death and rebirth endlesslycycle in the Material World in unceasing obedience to the Celestial and ultimately to the Divine Worlds. Marsilio Ficino, Three Books on Life, Bk. III, Chap. 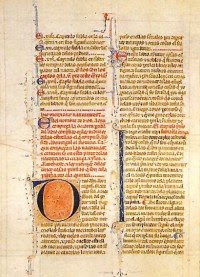 14, p. 311. To make use of the these chains of correspondence we must identify the qualities we wish to intensify or avoid, the material items that embody these qualities and the planets that rule them. I am going to start taking pre-orders for the sterling silver talismans of the Saturn that Wade will be casting November 24, 2008. These could almost be described as historic since we have not been able to make Saturn talismans for years with Saturn in detriment in Cancer and Leo for soooo long! We have actually never made Saturn talismans before since he has been afflicted as long as we have been making talismans. Saturn Talisman Election & Chart. On the back will be the planetary table of Saturn. Saturn talismans are good for power, growth, particularly in agriculture, building, discipline, control, (weight loss!) 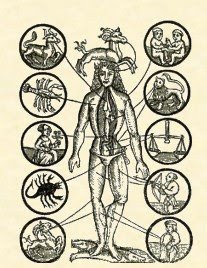 health, long life, occult knowledge, esoteric wisdom, philosophy, astrology and magic! This will complete the entire set of planetary talismans here at Renaissance Astrology and how fitting it is to end with Saturn, whose sphere is highest and whose wisdom deepest. If Saturn is in Aquarius or Capricorn (his signs) or Libra (his exaltation) in your chart, not retrograde or combust (within 8.5 degrees of the Sun) then Saturn should be excellent for you. 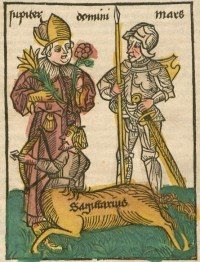 If Saturn is in Gemini or Sagittarius he is dignified by triplicity, not retrograde or combust (within 8.5 degrees of the Sun) he is nicely dignified by triplicity and again would be a good talisman for you. If Saturn is in Cancer or Leo (his detriments) or in Aries (his fall) or retrograde or combust (within 8.5 degrees of the Sun) Saturn is not for you. If you are seriously interested in getting a Saturn talisman you can send me your time, date and place of birth and I can check it quickly for you. Don't ask just for fun, though! This takes me time and energy and I need to reserve this check for actual clients. The cost is $199.95 plus shipping. With Saturn in Aquarius rising you can bet that I am going to get one of the first of these talismans! I attribute much of my success as a lawyer, astrologer and mage to this Saturn placement. One of the oddest things about magic is that it does not obey the usual rules associated with material causality, like cause A happening before effect B. In this case, having decided to make the Pleaides talisman and in particular in the form of acid etched mirrors, I have already started to experience its effects with regard to invocation and finding hidden knowledge. I'm not sure exactly why, I think it was Mike's reference to the Greek Magical Papyri, I started flipping through Betz' translation. 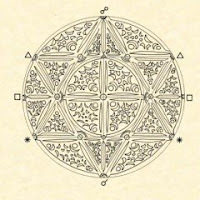 of a listing of the sigils of the 36 decan/faces! Wow! Very useful, very appropriate to my current tasks and what a strange "coincidence"
I have decided that my new definition of magic, at least so far as it acts on the material plane, is as the "art of consciously causing coincidences" ! Oh, star cluster of the Pleiades, O, Seven Sisters, I call upon thee, in your names of Alcyone, Maia, Taygete, Electra, Celoeno, Sterope and Merope, that you infuse this talisman with your power, pneuma and spirit. talisman with your power, pneuma and spirit. I conjure you O lord, who rise above the earth of the whole cosmic region, by the one ruling the whole inhabited world and the benefactor of all. Hence I call upon in this night and ask that you infuse this talisman with your power, pneuma and spirit, O angel ZIZAUBIO. May this talisman protect the light of the eyes, gather daimons and spirits of the dead to come and speak and make [the wearer] to know of secret and hidden things. I ask this in the name of the Seven Sisters of the Pleiades, Alcyone, Maia, Taygete, Electra, Celoeno, Sterope and Merope and in the name of the angel of the Pleiades, ZIZAUBIO and all of the spirits of the Pleiades. About 40 minutes before the casting window opened I turned on the electro melt (melts the sterling silver). I gathered up the frankincense and fennel for the casting. I printed out the invocation to the Pleiades that Chris emailed to the group. I always start all castings with an invocation to God. Since the Pleiades is not associated with a planet or Sephiroth. I invoked the names of God on the middle pillar of the Tree of Life. That is, Eyeyh (Kether), Yod-Heh-Vav-Heh (IHVH, Tiphareth), and Adonai (Malkuth). The intention was to open a channel from the Heavens (Kether) to the Earth (Malkuth). Once the metal was molten I took the flasks out of the oven and poured the metal. The first pour was completed 5 minutes after the casting window opened. The second pour was completed 10 minutes later. I placed the flasks on bricks (they are still well over 1000 degreesº F). I placed the incense on the glowing buttons and profuse smoke rose into the air. I began the Invocation to the Pleiades. But not too loud. I do have neighbors and did not want to attract attention chanting at 10:00 PM. Once the flask have cooled, I quenched them. I put more incense on a glowing charcoal and fumigated the crystallized silver for over 20 minutes. I repeated the Divine names and Invocation to the Pleiades again for each flask. It was a beautiful night. But I did not have the luxury to enjoy and sit in quiet meditation. Sterling melts at approximately 1,800º F. And the flask when they are sitting on the brick are very hot. One mistake and you are in trouble. There is an old saying, Temple conditions prevail. It is good practice to perform you ritual even when conditions are not optimal. It helps to develop your focus and poise. I have been really blown away by the power and incredible reliability of the Mansions talismans I have been working with recently. My Third Mansion talisman has been amazing, last month and this month the day of the Third Mansion was the biggest business day for me all month. Plus I had some pretty incredible results from my 13th Mansion talisman. I wish could tell you in detail, but you are just going to have to take my word on the awesome results. Mansion talismans rock! This means that I am very pleased to be able to share this amazing esoteric knowledge and occult power with you as I announce the revamp and relaunch of my Mansions of the Moon Mini-Course, now on CD! a $25 value! The readings in the book are now carefully integrated into the Course CD and lessons. http://www.renaissanceastrology.com/mansiontracker.html also a $25 value, that's a total of $50 worth with the free book and free software! Mansion Tracker is very cool and makes finding the Mansions quick, easy and simple. The Mini-Course has an unparalleled and comprehensive selection of traditional Mansion sources including Picatrix Bk I, chapter 4 & Picatrix Bk IV, chapter 9. What's really special and unusual is the inclusion of the Astromagia Mansions. Astromagia is a medieval Arabic text like Picatrix also translated in the mid 13th century, but available nowhere else but in the Mansions Mini-Course! Seriously, nobody has this, and these Mansion talismans in Astromagia are wild, some completely different from Picatrix. Finally to cap it all of the Mini-Course includes Ibn Hatim's Arabic Mansion with Arabic names of Mansions lords. Wow! Truly complete! But that's not all! The Mansions Mini-Course now includes 28 black and white and 28 full color images of each of the Mansions by our Nigel Jackson. Even better the color images are available in large size, high resolution format, easy to download, easy to print, perfect for making your own Mansion talismans! More, could there be more? You bet! The Mansions Mini-Course now comes with 3 step by step lessons to walk you through the sources, origins, location, elections and talismans of the Mansions clearly and straightforwardly. You can even work through homework, make your own Masterpiece Mansion talisman and earn a certificate as a Qualified Lunar Magician! Once you have registered for the Mansions Mini-Course you get an automatic discount on the full Astrological Magic Course. You don't need to graduate to go on to the full course. So, a very serious revamp and upgrade, the Mansions of the Moon Mini-Course on CD, with free Mansions of the Moon book, Mansion Tracker software, new translations, color images, homework and certificate, makes a great package! If you are already a student of the online Mansions of the Moon Mini-Course you can upgrade to the Mansions Course on CD + Mansions Book + Mansion Tracker for just $39.95 plus shipping. E-mail me at chriswarnock@renaissanceastrology.com for details. I will be issuing a comprehensive upgrade for full Astrological Magic Course students including the Mansions Mini-Course upgrade in the not too distant future. I am very pleased to announce the beginning of the Saturn Extravaganza! Saturn has the highest sphere of the planets and is appropriately the last of the planets that we will cast a talisman for. He has been in detriment in Cancer, then in Leo for years. He went into Virgo where he is peregrine and then went retrograde. Finally, after long last, we will be able to make a decent Saturn talisman! This is certainly a very special talisman. Saturn is the Greater Malefic and author of melancholy, yet the co-ruler of magic (with Mercury) and of the esoteric philosophy and deeper wisdom. When dignified, Lilly says, Saturn signifies one, "profound in Imagination, in his Acts severe, in words reserved, in speaking and giving very spare, in labour patient, in arguing or disputing grave, in obtaining the goods of this life studious and solicitous, in all manner of actions austere." CA 58. When afflicted, on the other hand, Saturn signifies one, "envious, covetous, jealous and mistrustfull, timorus, sordid, outwardly dissembling, sluggish, suspicious, stubborn, a contemner of women, a close lyar, malicious, murmuring, never contented, ever repining." CA 58. Ficino says that Saturn has a dual nature, "he signifies an individual set apart from others, divine or brutish, blessed or bowed down with the extreme of misery" Three Books on Life, Bk III, ch II Kaske & Clarke trans at 251. Ficino says, "Hence, by withdrawal from human affairs, by leisure, solitude, constancy, by theology, the more esoteric philosophy, superstition, magic, agriculture and by sorrow, we come under the influence of Saturn." Three Books on Life, Bk III, ch II Kaske & Clarke trans at 253. There are a number of possible variations on this election which we will explore in the coming weeks. We will be discussing how to adjust this election for your location and how to determine whether or not Saturn is compatible with your natal chart. We are going to have a new Nigel Jackson image for this election! Wade will be casting Saturn talismans and I am going to be etching Saturn mirrors. Nigel and his talented wife Patti are working on Saturn music! Wow! All hail lord Saturn!!! We look forward to a long meditation on your works, your essence and your spirit! There are four types of traditional astrology, (1) natal astrology, which looks at birth charts (2) horary astrology, which looks at the charts of the time questions are asked, (3) electional astrology, which choses astrologically auspicious times to take action and (4) mundane astrology, which uses a variety of techniques to look at weather, countries, dynasties and other "big picture" events. Traditional horary astrology has was revived through the efforts of people like Olivia Barclay beginning in the 1980s and we have a goodly number of practitioners with lots of experience. Traditional electional astrology has many similarities to horary, but is not quite as widely practiced. 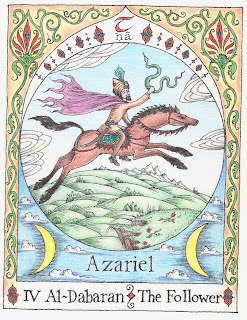 Traditional natal astrology was revived primarily by Robert Zoller, also beginning in the 1980s. Through his efforts and the efforts of his students, plus the fact that modern astrology is mostly natal, we also have a reasonable grasp on traditional natal. Traditional mundane, however, we have only just scratched the surface of. Learning traditional mundane techniques like Great and Lesser Conjunctions, eclipses and solar revolutions has only just begun. In my opinion no one has yet mastered traditional mundane. But traditional mundane is what we need to answer things like "what's going on with the financial crisis?" Since the theory behind horary, electional and natal is that the Cosmos is one great unified Being bound together by bonds of spiritual sympathy and correspondence, looking at large scale events should work too. One problem is that as you move from horary to natal, from a very tightly focused question to an entire life, the precision decreases significantly. Going from natal to mundane will likely involve a further loss of precision. mundane techniques. The predominant method has been to say "Well, Jupiter is the natural ruler of wealth, and is now afflicted, so wealth will be afflicted" This has been more or less true, as Jupiter passed out of his sign Sagittarius in 2007 and into his fall Capricorn in 2008. But that means that we should see an improvement in 2009 when Jupiter goes into Aquarius and I'll bet that the recession is not going to go away in January 2009. The obvious fact is the even the things Mercury is the natural ruler of, like contracts, sales, communications, Internet, we don't have a complete shutdown for all 6 billion people on the planet when Mercury goes retrograde. In fact some people have best contracts, best sales, etc. of their lives under Mercury retrograde. Ah, but "I always have problems under Mercury retrograde" "I can feel it!" Odd, that people don't feel Mercury combust or Mercury in detriment. The bottom line is that even those that "believe" in Mercury retrograde acknowledge that they cannot predict what will happen under it. Being unable to accurate predict means that one does not really understand what is happening. Clearly one of the problems is the extreme simplicity of Mercury afflicted = Mercury ruled things are all afflicted. Traditional technique, be it mundane or other areas is always much more complex, as befits an attempt to actually predict reality.